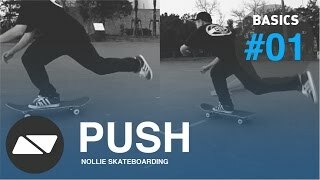 The following very simple exercises are precisely where you should begin as someone who is new to skateboarding. Try to be relaxed and at ease, yet focused as you practice. These exercises relate to mounting your skateboard, initiating forward motion, and stopping. The earliest stage of learning to skateboard is also one of the most dangerous. Injuries at this stage are not uncommon and if it makes you feel more at ease it is highly advisable that you take advantage of the protection and reassurance that protective equipment will provide you. If you (most likely still in your younger days then!) might be concerned with how the so called ‘cooler-cats’ and how he or she or they might react to your precautionary enthusiasm, get ready to practice the joy of owning and smiling back at what taunts you! Now, learning the exercises below in the most basic way shouldn’t take all that long, so go have some beginner’s fun. ‘In the beginning, there was mounting your skateboard.’ Here’s a ‘how to guide’ broken down into four steps. Keep your back foot on the ground and place your front foot over the front hardwares. Your front foot toe should be flared forward. By the way, if you are wondering to yourself, “Wait, which of my feet is supposed to be the front foot?,” well, it’s up to you. Choose whichever feels most natural to you. 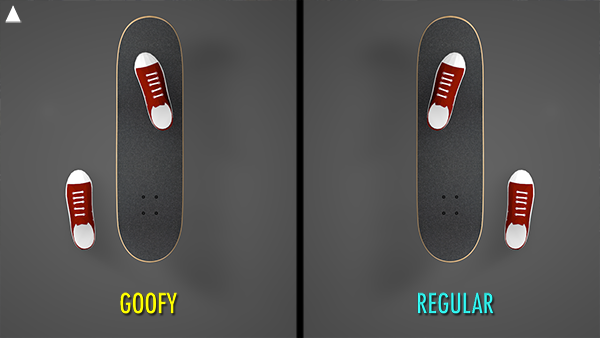 In skateboarding, there is the ‘Regular stance’ (left foot is forward) and the ‘Goofy stance’ (right foot forward). The ‘regular’ stance is far more common, hence the name, but neither is better or worse than the other. Now place your back foot over or just behind the the tail side hardwares of your board. In this position it makes sense to spread your weight evenly over your to feet. However, when it comes time once again to remove your back foot for the purpose of pushing yourself forward, be very conscious to shift your weight back over to your front foot. Getting adept at shifting your body weight from one foot to the other, or one side of the board to the other, or evenly over the center, is a critical aspect of improving your abilities on the skateboard. With both feet now on the board, you should learn to gently pivot your feet so that you can adjust their position. 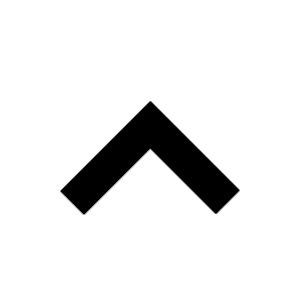 As a starting point, the image below is a good point of reference for the general angles your feet can assume as you stand un-moving on your board. Now let’s generate some forward motion. 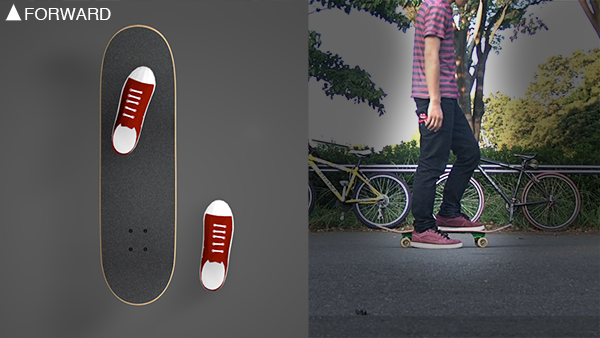 Mount your skateboard, and place your back foot on the ground roughly just to the side of the center of your board. Remember, your front foot should be flared forward. Keep the weight of your body bearing down on your front foot, and push off the ground with your back foot. Bingo, you’re moving forward. After pushing off with your back foot, go ahead and place your back foot over your back hardwares. In the process of bringing your back foot back onto your board, focus on maintaining your body weight bearing down on your front foot. Then, with the back foot now on the skateboard, go ahead and get used to shifting your weight so that it bears down on both feet more or less equally. 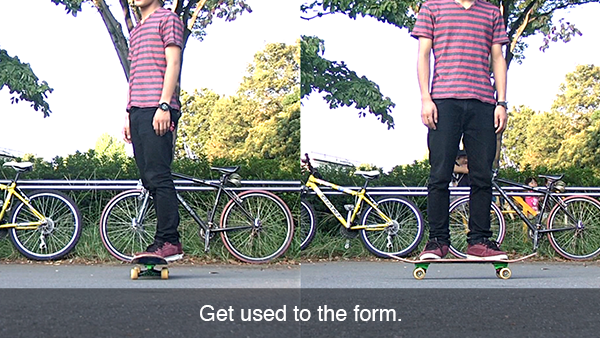 As the skateboard is now in motion, you have to balance yourself so that you stay centered over it AS IT MOVES. This part takes some getting used to! 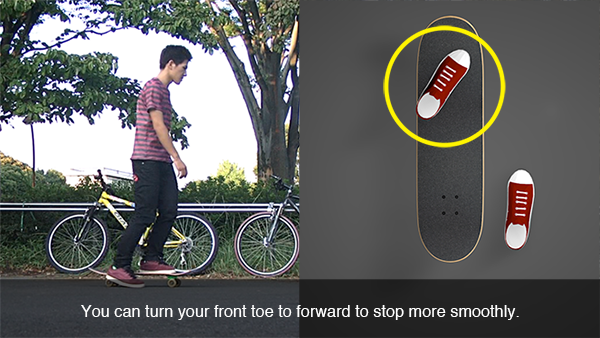 When you want to stop, take your back foot from your board and place it on the ground as a braking mechanism. The faster you are going, the more you need to properly judge the correct amount of force to apply to your back foot when braking. It can be dangerous the faster you go, so get comfortable breaking at very slow speeds to begin with and gradually familiarize yourself with how it feels to break at faster speeds. 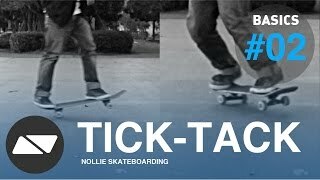 This is a matter of personal comfort, but in general it seems that most skaters have an easier time bringing their skateboards to a gradual halt if they maintain their front foot flared in a forward facing direction. After your board stops, dismount your board. As a beginner, getting off such a dangerous seeming plank on wheels is probably your body’s overriding instinct, so the dismount should come very naturally to you. 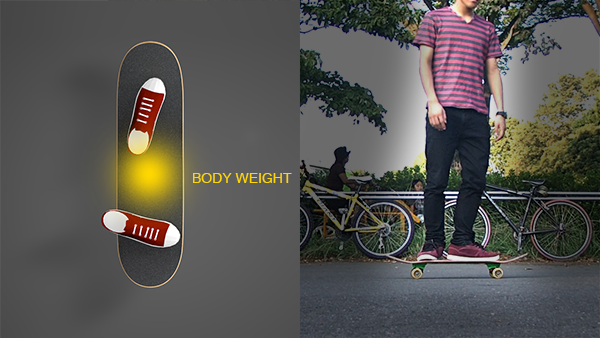 It’s simply a matter of properly transferring your weight from board to ground. Keep practicing until you get used to the series above. Remember that it’s not at all a bad idea to wear protective gear. Actually, in the simplest of terms, wearing protective gear is the smart thing to do. Try and practice in an area relatively free from automobile and pedestrian traffic, and the smoother the ground, the better. Be safe, and enjoy!